NASA’s Wallops Flight Facility and Virginia’s Mid-Atlantic Regional Spaceport are set to support the launch of Northrop Grumman’s Antares rocket, carrying the company’s Cygnus cargo spacecraft to the International Space Station at 4:49 a.m. EST, Nov. 15. The launch may be visible, weather permitting, to residents up and down the East Coast of the United States. 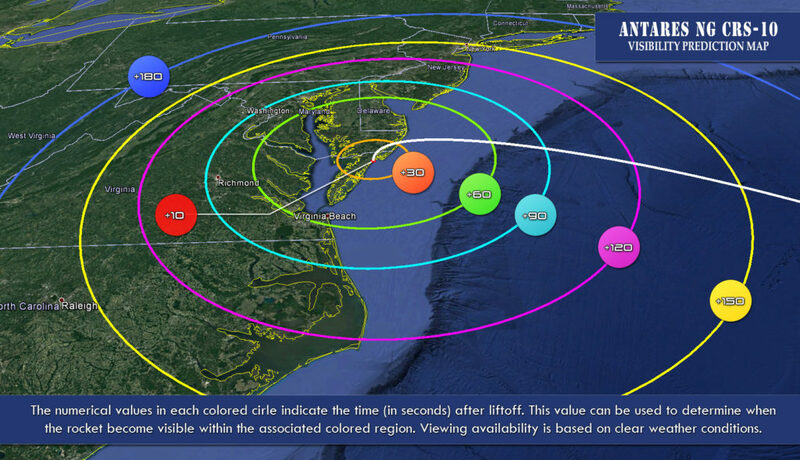 When accessed from a smartphone browser, the Wallops Mission Status Center website can provide specific viewing information based on your location. Live coverage of the mission is scheduled to begin at 10:30 p.m. Nov. 14 on the Wallops video and audio Ustream sites. Live coverage of the mission is scheduled to begin at 10:30 p.m. EST Nov. 14 on the Wallops video and audio Ustream sites. Launch coverage and commentary on NASA TV will begin at 4:15 a.m. EST Nov. 15. For local launch-viewers, the NASA Visitor Center at Wallops opens at 1 a.m. on launch day for public viewing. Additional locations for catching the launch are Robert Reed Park on Chincoteague Island or Beach Road spanning the area between Chincoteague and Assateague Islands. Assateague Island National Seashore/Chincoteague National Wildlife Refuge in Virginia will not be open for viewing the launch. Under NASA’s Commercial Resupply Services contract, Cygnus will carry about 7,200 pounds of crew supplies and hardware to the space station, including science and research in support of dozens of research investigations. Included in the cargo are investigations that will enable U.S. National Laboratory research, which is managed by the Center for the Advancement of Science in Space. They include a physical sciences investigation to evaluate a method for producing fiber optic cable in space and astrophysics research to examine the formation of chondrules, some of the oldest material in the solar system. What will the altitude be if viewing in Harrisburg Pa? Historically, Antares launches from Wallops have appeared at a maximum of five to 10 degrees above the horizon. If the launch does not happen on the 15th when is the next launch window? The next launch opportunity would be Nov. 16, with a slightly earlier window, which opens at 4:27 a.m. EST.